Dr Mosa Moshabela (MBChB, MFamMed, Dip HIV (SA), PhD) joined the University of KwaZulu-Natal in August 2013. Prior to joining UKZN, Moshabela was the regional health advisor for the Millennium Villages in West and Central Africa, based at the MDG Centre in Mali/Senegal, and affiliated with the Earth Institute at Columbia University, NYC, USA as a Public Health Specialist. He lead a team of technical experts to support implementation of programmes in Nutrition, Child health, Maternal health, and Malaria, HIV/AIDS and Tuberculosis sub-sectors, relevant to the Millennium Development Goals (MDGs) for health. Moshabela facilitated integration between health and non-health sectors applicable to the MDGs. He joined the Earth Institute from the School of Public Health at the University of Witwatersrand, Johannesburg, where he worked for five years as Senior Lecturer and Director of the Rural AIDS and Development Action Research Programme. Moshabela also trained as a clinical specialist in Family Medicine and Primary Health Care, and has gained more than ten years of on-the-ground and hands-on experience working in rural South Africa focusing on health systems and policy. His interests include health systems strengthening in resource-poor settings, primary health care for HIV/AIDS and TB, maternal and child health care, and the public health dimensions of controlling chronic infectious diseases in resource-limited settings. He has over the years led several clinical and lay health care programs as well as research projects, translated into a number of scientific publications. 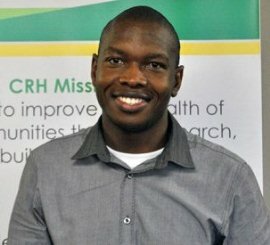 His PhD investigated rural health care systems and user behaviour in South Africa, with special reference to equity, access and utilisation patterns for rural patients seeking and using antiretroviral treatment. He was awarded a prestigious Discovery Foundation Academic Fellowship Award to support his career development as a clinical specialist in pursuit of a research scientist career. He is now head of department and chief medical specialist in rural health, and hopes to contribute to the transformation of rural health through creation of platforms to achieve rural academic excellence, and more specifically hopes to build scholarship in the trans-disciplinary field of rural health and development. Published Manuscripts:1. MacPherson P, Mosa Moshabela, Neil Martinson, Paul Pronyk. Mortality and loss to follow-up among HAART initiators in rural South Africa Trans R Soc Trop Med Hyg 2009, 103:588-593. 2. Jonathan E. Golub, Paul Pronyk, Lerato Mohapi, Nkeko Tshabangu, Mosa Moshabela, Helen Struthers, Glenda E. Gray, James A. McIntyre, Richard E. Chaisson, Neil A. Martinson. Isoniazid preventive therapy, HAART and tuberculosis risk in HIV-infected adults in South Africa: a prospective cohort. AIDS 2009, 23:631–636. 5. Moshabela, M., P. Pronyk, N. Williams, H. Schneider, and M. Lurie. 2011. “Patterns and implications of medical pluralism among HIV/AIDS patients in rural South Africa.” AIDS and Behavior Volume 15, Issue 4 (2011), Page 842. 6. Lisa Kakinami, Guy De Bruyn, Paul Pronyk, Lerato Mohapi, Nkeko Tshabangu, Mosa Moshabela, James Mcintyre, Neil A. Martinson. 2011. The Impact of Antiretroviral Therapy on Activities of Daily Living in HIV-Infected Adults in South Africa AIDS & Behavior, Volume 15, Issue 4 (2011), Page 823.